One of the oldest congregations in Greensburg, the history of this church is complex and a thorough history will be presented here shortly. Histories recorded by past members of the Emmanuel Church can be viewed below. For more information about the Evangelical Movement and Greensburg Seminary - our College once located in Greensburg - click here. Emanuel United Methodist Church has a rich and interesting history. Conrad Dillman was the forerunner of the Greensburg Circuit of the Evangelical Church. He was converted in the time of Jacob Albright. In 1813 he and his wife migrated to Greensburg from Pennsylvania. Other Evangelical families from Pennsylvania joined the frontier settlement. Dillman was concerned that his fellow settlers were deprived of religious worship and, with Bible in hand, he went from cabin to cabin teaching and praying with the people. The Dillman log house became a shelter for circuit preachers and a place of worship for the Evangelical fellowship. Adam Klinefelter came to Ohio to be the first resident presiding elder. He and his family figured prominently in the Greensburg work. It was on the land of an Evangelical family, that of Abraham Wilhelm, where the first plot of ground was surveyed for the village of Greensburg in 1828. The first permanent organization of the Evangelical Association in Greensburg was made by Adam Klinefelter and Elias Stoever in 1829. The earliest move in Ohio toward building a house of worship was taken at a meeting called for this purpose on September 21, 1833. The project found no supporters at this time, but after five years there was a change in attitude and a site was procured on the farm of Peter Thornton, three-fourths of a mile west of Greensburg where the first Evangelical Church building in Ohio was built in the summer of 1838 at the entrance of the Greensburg Cemetery. A stone marker stands on the site of the first church. It was a plain meetinghouse without cornish and with neither tower nor bell. The first church became too small to hold the crowds of people, and a substantialframe building, 45' x 60', was dedicated on May 4, 1851. This church was located in the village and narnad Emanuel. From the congregation at Greensburg also came the first promoters of a higher institution of learning in the Ohio Conference. They established a seminary in 1855 which served until 1866 when it closed. The original church building had been moved into town from the cemetery lot and converted into a rooming house for seminary students. When this territory came under the supervision of the Pittsburgh Conference in 1859, the name of the field was changed to Summit Circuit, and Greensburg was made a station. In 1871 Greensburg, Greentown, McDonaldsville, and New Berlin (North Canton) were taken from Summit Circuit and reconstituted Greensburg Circuit. In 1876 Greensburg and McDonaldsville were separated from the circuit and made a station. A controversy took place in the church conference, and two congregations in Greensburg resulted--one under The Evangelical Association and one under The United Evangelical Church. The United Evangelical Group erected a church which was dedicated as Trinity United Evangelical Church in 1895. On December 22, 1889 a new frame church was dedicated and named Emanuel by The Evangelical Association. These two churches were across the street from one another. On October 14, 1922 at a special conference the two churches, The Evangelical Association and The United Evangelical Church were united under the name of The Evangelical Church. Therefore, the two congregations combined their forces for a united church. Plans were agreed upon to sell the Trinity property and apply the proceeds for extensive improvements to Emanuel Church, and the building was rededicated on October 25, 1925. In 1940 a Sunday School annex was dedicated. Two great movements, The United Brethren Church founded by Philip William Otterbein and The Evangelical Church founded by Jacob Albright were united into the Evangelical United Brethren Church in 1946. On April 23, 1968 the Evangelical United Brethren Church and the Methodist Church united to become the United Methodist Church. The congregation outgrew the frame building which was located at 2200 Greensburg Road, and plans were made either to add to the present church or relocate and build a new church. After many years, the property located at 2161 Greensburg Road became available and was purchased to build a new church. Ground was broken for a new church building on May 22 J 1966. Cornerstone laying was held on September 17, 1967. 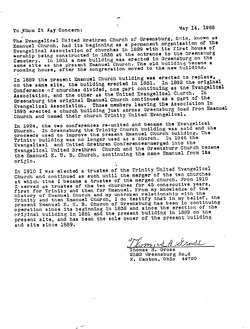 On November 19, 1967 the first service was held in the new church. The church was dedicated on January 21, 1968. The following information was copied from microfilm copies of the Summit County Beacon on file at Akron Public Library and Bierce Library at Akron University by Bev Coss, date unknown. May 1, 1889. "Greensburg--The noise of hammer and saw soon be (sic) heard in the erection of the new church. May the burg soon be able to boast of a grand new house of worship." July 3, 1889. "The following was deposited in the corner stone at Greensburg last Sunday: A Bible, hymn book and discipline of the Evangelical Church, German and English weekly church papers, Sunday School papers, Quarterlies and Teachers and 'My Lesson'; names of the trustees and building committee, a copy of the Weekly Beacon, and list of the names of all who have subscribed for the building of the new church." Aug. 28, 1889. "Greensburg--The beautiful ornament, secured at Salem, 0., was placed on the pinnacle of the of the 70-foot church steeple. The building committee did wisely in selecting the one they did. The bell has been put in the new Evangelical Church." Nov. 13, 1889. "Greensburg--The new church is being frescoed by Messrs. Waldron and Grimm. Some very fine stencil work is being done."